Among the many things I tried out this school year, making reading a regular habit was one of my favorites. It was a powerful addition to my teaching, not just because of what I was able to take back to my classroom, but also because it was a form of self-care. The nights where I had the time to read for 20 or 30 minutes were often my best nights of sleep. But I'm grateful for the ways my reading habit helped me in the classroom as well. Reading books like Jesmyn Ward's Sing, Unburied, Sing allowed me to practice my metacognitive skills, and reflect on what my brain was doing as I was reading. I shared some of these experiences with my students, which I think helped democratize our reading lessons in a way. By showing them that I'm a reader too, and that I was trying to pay attention to the same things I asked them to pay attention to, I tried to give their reading lessons a greater real world significance. 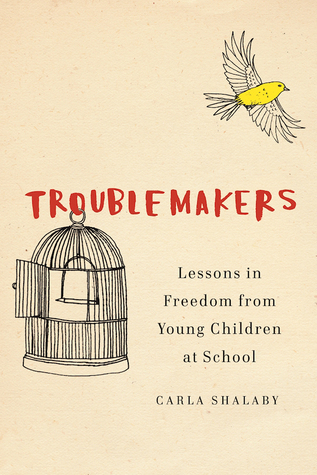 All of the books I read this year impacted me as a person and as a teacher, but the book that probably had the biggest effect on my teaching was Carla Shalaby's Troublemakers: Lessons in Freedom from Young Children at School. I wrote one reflection on the book in January, but as the year comes to a close, I want to take time again as a way of thanks to Dr. Shalaby for her writing, and to share the ways it shaped my teaching this year. What I valued most about Troublemakers was the way it challenged me. It didn't challenge me by proposing a philosophy radically different from my own. It challenged me, because it put a mirror up to my teaching, and I was forced to see the gaps between my teaching philosophy, and my teaching practice. At the outset of the book, Dr. Shalaby outlines a powerful metaphor of schools as environments that are as toxic as coalmines, and troublemakers are the canaries in the coalmine. That metaphor, and the poignant portraits of the four young children in the book, haunted me for much of the school year. One of my takeaways from the #TeachResistance Troublemakers book club I participated in was that teachers are inside the coalmine as well. We did not construct the coalmine. Much of what is toxic about schooling is the result of structures beyond our control. We may not control our curriculum. Or how many minutes of recess our kids have. But we have tremendous power nonetheless. And we can use this power to shape the schooling experiences of young people in ways that either nurture or harm. Early in the year, one student emerged in my class as the troublemaker. Teaching at a school in Central Harlem that serves a population disproportionately impacted by food insecurity, homelessness, and domestic violence, there are a high number of students who experience trauma. And this leads to challenging behaviors. This student however, demanded an extraordinary level of attention and patience. He often refused to participate in lessons or independent practice. Early on, when we pressed him to do work, he would just stand up and walk out of the classroom. I did my best to approach him with care and respect. I asked him about his interests, about his family, and his hobbies. I asked him what he wanted to learn. I asked him what school would look like if he was in charge. But nothing seem to work. And this is why I'm grateful for Troublemakers this year. Because when I got frustrated, and angry, and didn't act as my best self, the book stayed present in my mind. And in a way, it held me accountable. When I would engage in power struggles, or revert to punitive tactics, the words of Troublemakers reminded me that this was a losing proposition. Troublemakers reminded me that even if I somehow coerced compliance from this student through these actions, I would lose out on my ultimate goal of honoring and empowering all the children in my care. Troublemakers pushed me to keep trying with this boy, again and again. I'm not sure I would have had the same persistence if I hadn't read the book this year. Philosophies like democratic schooling are valuable, not because they guarantee immediate success. They are valuable because they hold us to a standard of respect and dignity for all, even (or especially), when that is hardest to implement. Troublemakers does an incredible job of clarifying a democratic approach to schooling. But what was most powerful about Troublemakers was that it illustrated the human stakes of the choices we make as teachers. The portraits of the four first graders in Troublemakers helped me understand the costs of a punishment-compliance driven approach to schooling in a new way. When we teach in this way we often end up excluding the troublemakers from our classroom communities. We also often make the other children complicit in this process. As a teacher, the work of trying to create a democratic classroom is so personal, it's hard for me to reflect on it clearly at times. When I struggle with it, I tend to revert back to the carrot/stick approach to teaching. Knowing this is at odds with my core beliefs, I internalize this failure, and question my fitness as a teacher altogether. 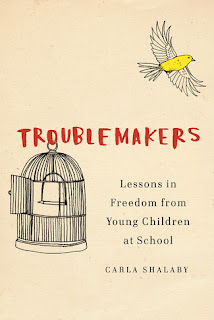 But, Troublemakers reminded me that creating freedom in our classrooms requires tremendous work. It won't be easy, and I will definitely fail at times. But, that's not because of some inherent weakness in my character. Recognizing this reality, I need to fight back against the overall structures that constrain freedom in schooling. I need to continue to build community with other freedom fighting teachers. I need to simultaneously be kind with myself, and urgent in my efforts to do better. Most of all, I need to enlist my students in this work. "What would it look like – and what would it signal – if we used school as a place to invite young people to understand problems of power together, to recognize hurt and anger as righteous, as sensible responses to the world in which we live? What would it mean if we mobilized young people to address these human harms, practicing first in the relative safety of our classrooms, so they could then graduate to thoughtfully, fiercely, intelligently, bravely addressing human harms in the world beyond school?" This is the schooling I want to be a part of. I'm grateful Troublemakers made this calling such a unforgettable part of my teaching this year. I know the book will stay with me, long after this year comes to a close.